Smoking throughout the day is akin to living inside a burning building. Smoking degrades the collagen of your skin causing premature aging, destroys the cells inside your lungs, and promotes heart disease, cataracts and cancer because of the oxidizing radicals released into the blood stream. It can contribute to back pain by dehydrating the spinal discs. 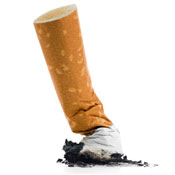 People stop smoking every day and so can you. Some people find acupuncture to be very helpful at reducing cravings and many people have used nicotine patches for the same reason. But these are not as effective as your unswerving, absolute commitment to do whatever it takes to not smoke today. Just limit your not smoking to today only. You can tell yourself that you can have a cigarette tomorrow if you just make it through today. Tomorrow morning when you wake up, tell yourself the same thing. There are many addicts who have successfully kicked their alcohol, heroine or cocaine addictions this way. Kicking any addiction is tough. You can expect to feel stressed, anxious and irritable at first. To expect anything else is unreasonable. But you can also expect that over time it will become easier and easier to not smoke.